Netflix’s marketing department has gotten pretty weird and DIY-influenced before: witness these video-pausing socks the company taught users to make last year. But that “go make it yourself” urge may have reached its peak with the streaming service’s just-debuted “Netflix Kitchen” series on YouTube, in which an unseen chef constructs elaborate foods based on the service’s hit summer series Stranger Things. The Demogorgon Pie actually looks pretty nice—the slivered almond teeth are a nice touch—but we’re not sure what to make of a bowl of French onion soup based on a dead teenager’s face. In a move that probably doesn’t constitute the #JusticeForBarb everybody has been asking for, the video shows would-be cooks how to make a bowl of soup that resembles the slime-covered corpse of everyone’s favorite dowdy party-hater. The steps for French Onion Barb actually seem pretty simple: First, you construct a loaf of bread in the shape of Shannon Purser’s head. Then, you set it in a bowl of soup, and melt Swiss cheese on top to capture that “used as a nightmare incubator by interdimensional monsters” look. 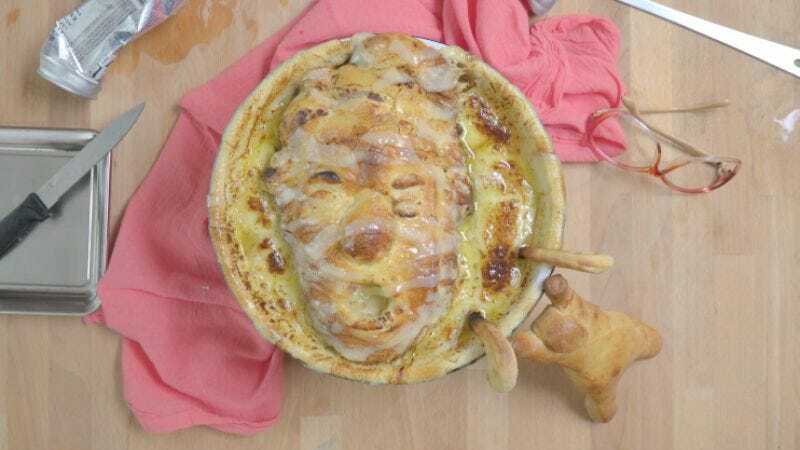 And while we might have gone in a different direction—i.e., waffles—for Stranger Things-inspired food, we have to admit Monster Pie and Dead Teenager Soup look at least as tasty as they’ll seem tasteless to the millions of Nancys out there whose hearts were broken by Barb’s sudden demise.